Gone are the days when we had no other option other than Adobe Photoshop or Illustrator for our graphic designing needs. Nowadays much online software is available with a lot of integrated features that make our job hassle-free. I was looking for free online graphic designing software and came across a site called DesignCap. What attracted me is that it was a 100% free to use website with no pricing structure at all. I became eager to try it out, and it turned out to be great. 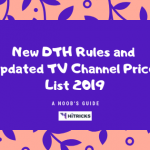 It has some exciting features that prompted me to write this article so that you can try it out too. 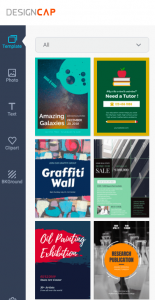 In today’s article, I will discuss DesignCap and its features, and also give you a demo of the kind of posters or flyers you can create with it. With that being said, let’s get started. I will go through the features of DesignCap in brief, so that you get an idea about what you can do with it. There are three simple and easy steps to create your poster. First, Visit DesignCap website to Sign Up and create your DesignCap account. 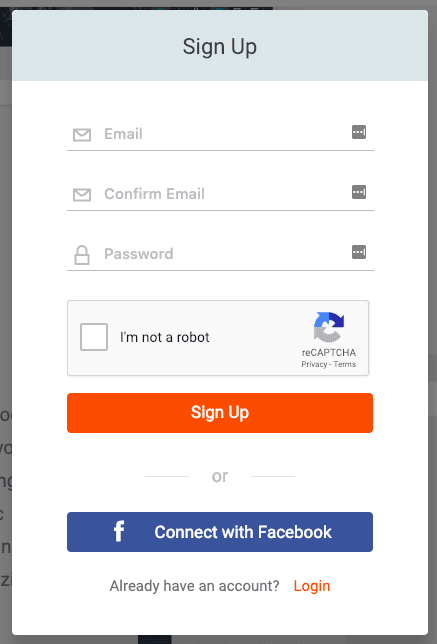 Click on the Sign-Up button on the Top Right. Enter your Email ID and choose your Password. 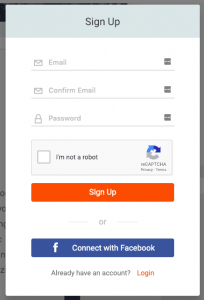 You can also Login with Facebook for quicker sign-ins. Don’t forget to confirm your account from your email. After your account is verified, visit the DesignCap Homepage. Click on Make a Free Poster/Flyer. It will take you to the online editor. The good thing is that the UI is straightforward and looks similar to the FotoJet UI, if you have used the following software, you can easily recognize it. The bad thing is that the poster sizes are predetermined, and cannot be modified. It’s 297 x 210 mm, or roughly 29cm (width) by 21 cm (height). While this size is the standard size for making posters, I feel they might not suit everyone and should have been flexible so that a user can customize it according to the size they want. I searched around a lot in a hope to find a way to change the sizes, but couldn’t find. Anyways, moving forward here’s how to design your poster with a few clicks quickly. 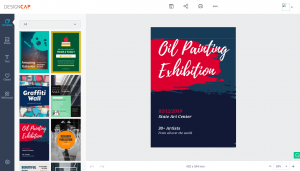 On the left, you will find a Template section, with hundreds of ready-made free templates that you can add to your poster. You can sort templates categorically. If you go through the templates, you will notice that they aren’t casually made. They look professional and is suitable for most of your use case scenarios. I found the templates section particularly helpful. Similar professional templates provided by other online graphic designers are chargeable. 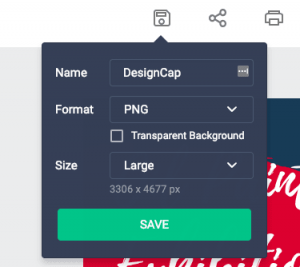 Designcap offers it free of cost. Well, as of now, there are limited templates available. I hope templates will be added in future. But wait, you can make your templates with 580,000+ Royalty Free Stock Images available in the DesignCap repository. 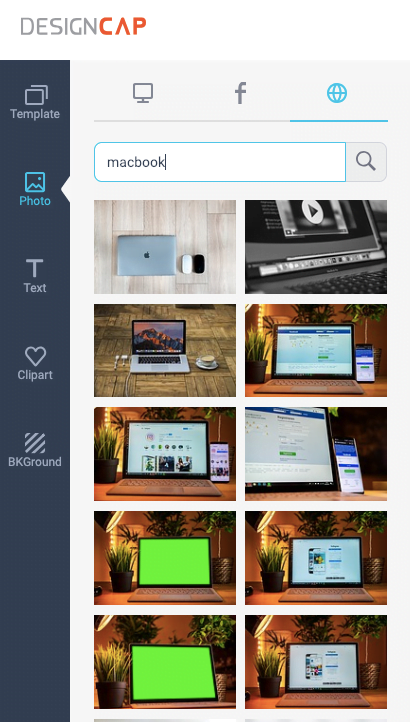 Search for any term, and you will get access to thousands of stock images. And, when I mean stock images, I assure you that they are professional grade pictures that you can use as stock photos. 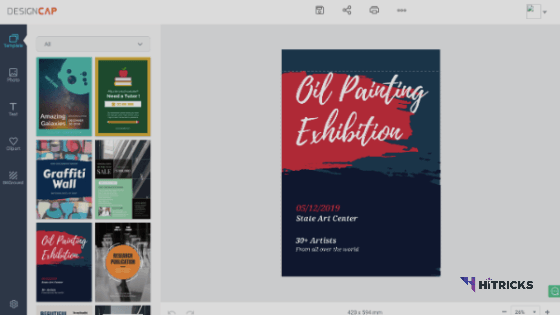 The ready-made templates and stock photo availability are my favorite reasons for recommending DesignCap as a free Online Graphic Designing Software for making Posters and Flyers. 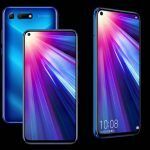 There are three ways to add images. You can either search the DesignCap image repository for free stock images that you can use or else you can connect your Facebook account to use your Facebook pics, else you can upload your picture. For every image you add, you can crop and resize the image, make a duplicate, rotate and flip the image horizontally or vertically, move it up or down the layers, apply filters to the image, adjust opacity, exposure, brightness, contrast, saturation, and hue. After you import your desired picture, its time to import texts and clip arts. DesignCap provides a wide range of clip arts, sorted categorically, that you can use in your poster. From a funny emoji to a birthday party, there are unique clip arts that suit every mood. 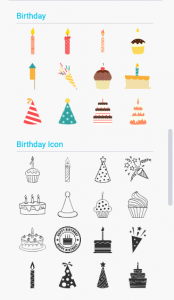 You can combine different clip arts to create unlimited combinations of images. Coming to adding texts, You can choose to enter a Heading, Sub-Heading or Body Text. 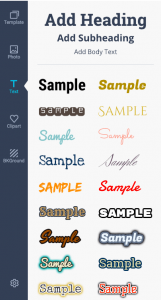 Below it, you will find some text styles to choose from. However, it is limited compared to other online graphics designer I have tried. 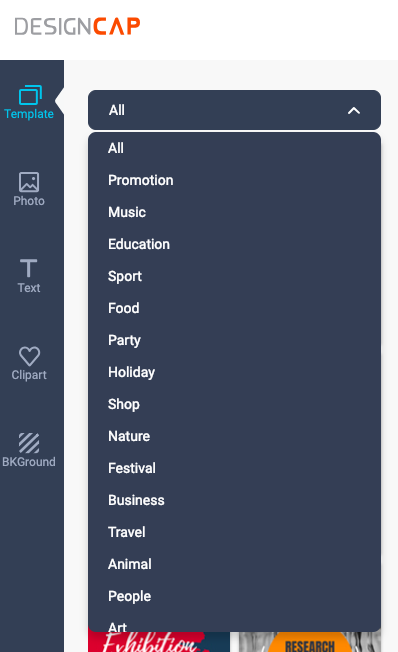 For every text or text style, you add, you can change its color. Color pads are available where you can either search for your favorite color combination with a mouse or type your color code to select your desired color. Finally, you can add your desired background to the image by choosing from some preset backgrounds. Of course, you can choose any style and later change the color. Here’s a small tip from my side: If you are interested in writing text above any image, then, first choose a black background for your project. Now, upload your picture or search for it. After you add your photo, bring down the opacity a bit. You will find the image will start fading, and the dark background beneath it will start exposing. Adjust the desired opacity and add your text above it. I assure you, it will give you a better outlook to that picture than just usually using the photo and applying text over it. I have done this to countless images that I make every day, and all of these turned out to be superb. Try it out! Anyways, after you are done editing, its time to export your picture. Designcap has multiple ways to export. If you are interested in downloading your photo, you can click on the save button on the top and choose either JPG or PNG as the download option. If you want PNG, it will optionally offer you to keep pictures with a transparent background. 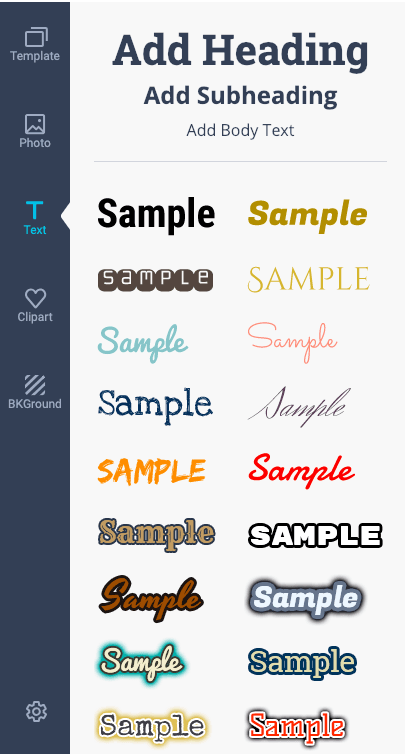 This option is helpful especially if you are creating a logo and need a transparent background for the same. You can also choose your desired resolution from here. Anyways, if you want to share your photo to the social media, you can do it directly from DesignCap, with the share button. 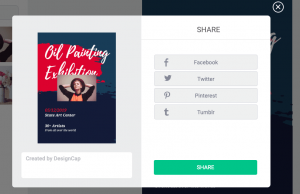 It offers one-click sharing to Facebook, Twitter, Pinterest, and Tumblr. A popular option Instagram is missing, which is surprising! DesignCap also offers to take a Print Out of your picture, click on the print button and it will open the printer interface where you can follow further instructions. Finally, if you are just interested in keeping your project for future work, you can do so, by clicking on the three dots and then clicking on the save project option. It will be saved as a .dcp file, so you can further work on that using Adobe Photoshop or other graphic designing software. You can load a saved project by clicking on the load project option. One Reminder: Don’t close your browser if you aren’t done with your project yet. And, if possible, save your project offline. This is because, once you close your session, your image is gone forever. It is not stored in your account for later use. You can only access it if you save the original project .dcp file. So, take caution. 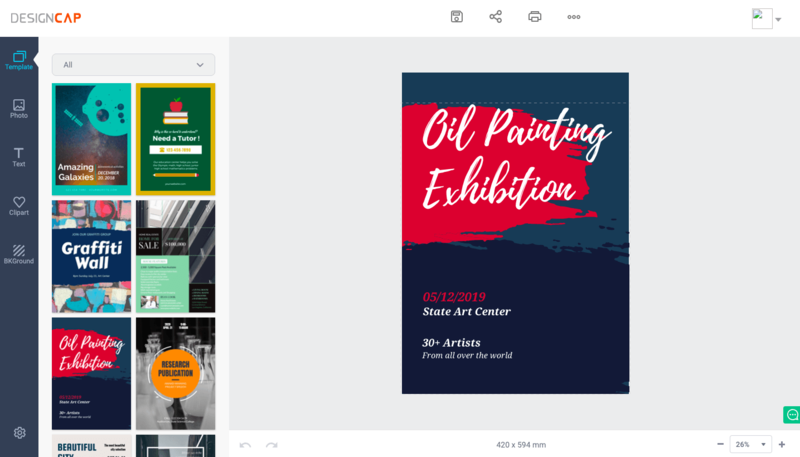 DesignCap is one of the tools that don't store a lot of features within, but whatever even with its limited tools, you can create professional designs. It has a wide range of royalty free stock images, readymade templates and clip arts that you can use in your project to create stunning results. However, the lack of changing image size is a letdown for me. Still, as a free tool, I recommend DesignCap. 580,000+ Royalty Free Stock Images. Hundreds of Readymade Templates and Clip Arts. Save Project offline for future use. Poster Size is Pre-defined and can't be changed. No online repository to store your uploaded pictures. That’s all about DesignCap Free Online Poster Designing Software. I mostly liked its features as a 100% free to use website, and I recommend you to give it a try. See how it works out for you. If you have further queries, then let me know in the comments section below. I will be happy to help you out. And don’t forget to share this post with your friends and let them know about this free utility. Use the floating social share buttons below or on the left if you are from a desktop. Thank you for reading. I will be back soon with another exciting update. Till then, stay tuned!